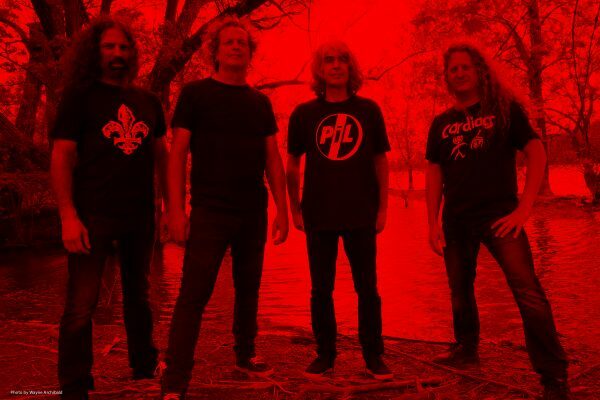 If there is one thing Voivod fans have been able to expect throughout the band’s 35-year career, it’s that they never make the same album twice. You could say that’s true of all bands, but Voivod’s albums are very different from each other. Early on, such as on their first two albums, War And Pain and Rrröööaaarrr, they were pretty straightforward thrash band but with punk-ish vocals and occasional prog elements. However, as time went on, their prog side showed more and more on albums like Nothingface and Angel Rat. Meanwhile, their intense music grew increasingly technical. But not in the way that some refer to bands as “math rock.” Voivod might be precise, yes, but they’ve never sat around doing math problems to figure out what parts of their songs should sound like. 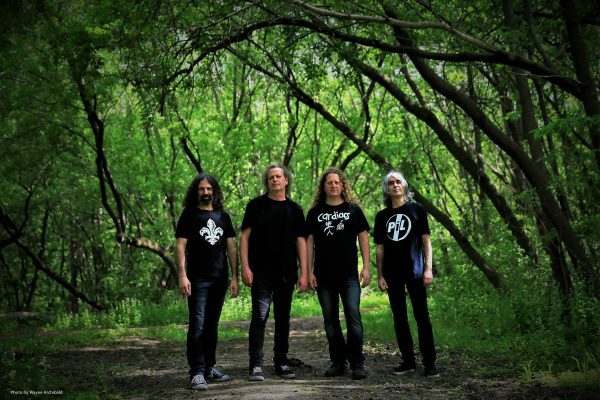 If there’s a second thing Voivod fans could count on, it’s been their intellectually stimulating, metaphorical lyrics in which society is often reflected through a sci-fi lens where aliens threaten us and conspiracy theories abound. You can credit frontman Denis “Snake” Bélanger for those, as he’s always been the band’s lyricist. In the music department, most of the writing was always done by Denis “Piggy” D’Amour, who sadly passed away from colon cancer in 2005 at the age of45. 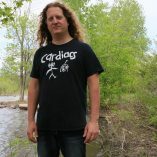 Many fans thought that would be the death of Voivod, but Denis left two albums worth of guitars on his laptop when he passed and the band did, in fact, make two albums utilizing them. Then it came time to find a new guitarist. 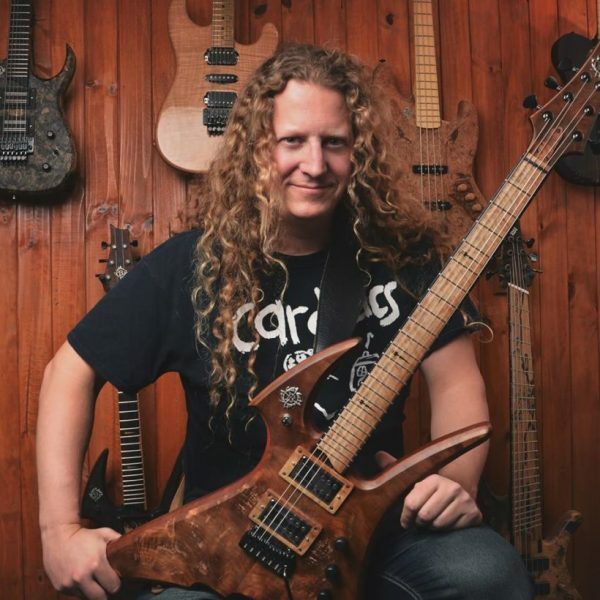 Enter Dan “Chewy” Mongrain, whose second album with Voivod, The Wake, is due out on September 21st, 2018 via Century Media Records worldwide. In the following interview, Dan and I discuss how he came to be in the band, how their songwriting process currently works, and all things pertaining to The Wake. Having heard the album, I can assure you that it’s one of the band’s best. But this won’t come as a surprise to anyone who’s heard Target Earth, their previous album, which also featured Dan’s exemplary playing and songwriting. MM: First of all, do people usually call you Dan or Chewy? DM: It depends on how long they know me. Or from where, you know? It could be one or the other. I don’t really care. But Chewy is very handy when it comes to touring and working with people from different countries if there’s more than one man in the group. I always know it applies to me. MM: Where did that nickname come from? Was it chosen by you or did one of the other guys in the band give it to you? DM: It’s actually an old nickname that I had [laughs] in another life. Because I have very long hair and I was screaming – singing, so to speak – in my other band Martyr, and everybody knew at the time that I was a big Star Wars fan, so it really comes from the Chewbacca character in Star Wars. Somebody started to call me Chewy so I went with that name. MM: I understand that you were a super fan of Voivod long before you were a member of the band. Can you tell us how you first heard of the band and how you went from there to being one of their biggest fans? DM: I discovered heavy metal in my early teenage years. Like ten or eleven years old. During the video-clip era. There was rarely heavy metal on TV at the time, but there was one TV show that would put some heavy metal video-clips [on] but we didn’t have cable so the image was distorted, but we could hear the sound. I was watching it just to hear some new stuff. At some point on the show I heard Celtic Frost, Koroner and Voivod back-to-back. And I already knew about Metallica and Slayer and bands like that. So, it was probably ’87 and I saw a clip for the song “Ravenous Medicine” from the Killing Technology album. I was eleven years old and I was totally impressed with how they sounded different than all the other bands. And how the guitar was more often in the highest register of the instrument. And not chunky riffs like the other bands. The vocals were so punk-ish, so strange, and the chords were so different, and I could see some of the drawing through the distorted TV screen, and I was like what the hell is that? And I didn’t even know they were from Québec at the time. So, I became a fan and went to the store and bought the album. Maybe a few months later, I bought a guitar because I wanted to do that. I wanted to try it out. So, it’s basically because of Voivod that I play the guitar. And I never stopped listening to them because from album to album they evolved so much, and the music got more intricate, and more progressive, and kept the thrash metal side, of course, but it grew. It evolved so well. Every album was so different. 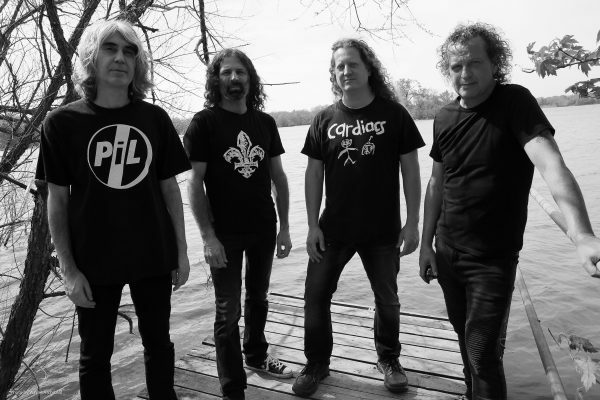 They were really a role model for me and my career in my other bands – to try to have my own voice as a singer, as a guitar player, and as a band – and be the most authentic possible with the art inherent in Voivod so to speak. 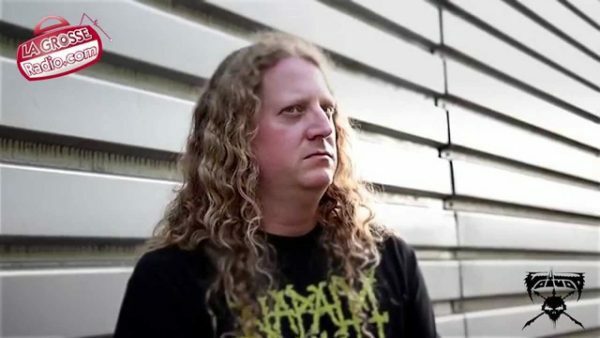 MM: I know he’s not with the band any longer, but I understand you and Blacky knew each other prior to Voivod and that he rejoined at the same time that you joined. 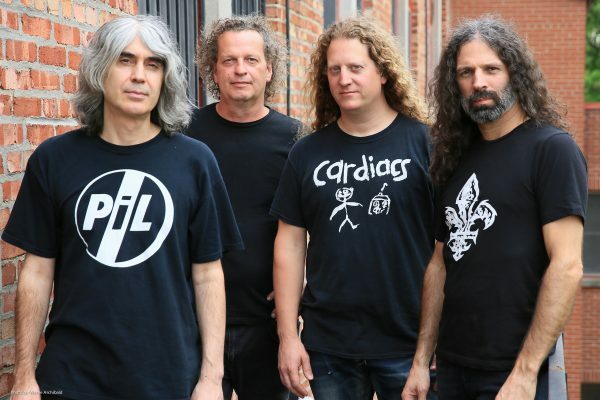 How long had you known each other before joining Voivod? DM: Well, we met each other because he moved back to Montréal at some point. He didn’t play bass for seventeen years, really. He didn’t touch an instrument for all those years he wasn’t in Voivod. But a producer wanted to celebrate the twenty years of metal in Québec, which was basically when Voivod turned twenty at the same time. So, he put together an all-star band from metal bands. Flo Mounier from Cryptopsy was on the drums. The singer was from a local band called Barf and me on the guitar. And Ted O’Neil from Oblivion, which was a big local band as well. And Blacky on the bass. But Blacky didn’t know how to play anymore. So, I had to teach him that. That’s how we became friends. We played some Voivod songs in the set. We played some Possessed. Exodus. Celebrating the thrash metal era. And five years later – Piggy passed away during that five years – the same promoter wanted to pay tribute to Piggy. He asked me to take care of the Voivod medley that we would play for Piggy and the guys in Voivod that were in the venue. Piggy’s family was there. His father, mother and sister. So, we prepared a 15 minute Voivod medley, which is online. And that’s where Away and Snake saw us play together and it started from there, I think. MM: What year did that happen? DM: Well, it was in between those two shows I did with Blacky. Blacky became a sound guy in Montréal so I was looking for work for him. When Martyr needed a sound guy, we hired him a lot of times to tour as well. To work as our sound guy. At some point, I wanted to do a cover of Voivod. Ever since before Piggy passed away. And I thought, now’s the time to do it. Blacky playing on it was just a bonus. MM: Did you know any of the other guys in Voivod before you joined? DM: I ran across Snake and Away a few times. But I didn’t know them. We knew each other from the music scene and we talked a little bit, but not much more than that. Actually, I was playing in a musical in Montréal called Dracula and Voivod’s name comes from Bram Stoker’s Dracula. So, Away was curious about the show, so I invited him to come to the show, and he thought it was great, and he saw me play that night as well. And we were in contact from then a little bit. MM: Did they need you to audition when you joined the band or had they already seen you perform enough that they didn’t need you to? DM: Yeah, they saw me play some Voivod songs with Blacky, like I said, for the 25th anniversary of metal in Québec, as well as to pay tribute to Piggy. I received a call the same year because they had an offer to play a show at the first edition of Heavy Montréal and that was ten years ago. So, it’s my tenth year this year of my being in the band. MM: It goes by fast. DM: Yeah, time flies by. So, Michel called me. At first, I told him, if you ever want to do a tribute show or one song or whatever, I would be very happy to play with you guys. I know the catalog, I’m a big fan, blah, blah, blah. And so a few months later he called me and said, “Hey, we have an approaching gig to play with Voivod.” And I really didn’t understand what he was saying to me. “You’re saying that you want to play as Voivod?” “Yeah, yeah, it’s gonna be Voivod.” “What?” I couldn’t compute. And finally I got to the rehearsal and we played the first song. Snake was kind of worried about how it would sound and after the first song he just gave me a huge hug and a welcoming and heart-warming, “Wow.” He closed his eyes and Piggy was kind of in the room. From that point on, I knew they were accepting me and that it would be fun. But it was supposed to be one show and it’s been ten years now. MM: Had they already done the two albums that they made using the guitars found on Piggy’s laptop or were they still doing those when you were in the band? DM: Yeah, I think they recorded Katorz during that period. If I’m not mistaken. Or it was freshly done when I joined. MM: How nerve-wrenching was it, in the beginning, to go back and forth between your style and Piggy’s style when you’re playing his songs then you’re playing your songs? DM: Not really. Because the music of Voivod is in my DNA so to speak. I’d listened to them so many times. It was part of my vocabulary. I could speak this language with ease. But I have my own playing and Piggy had a very different playing [style] than I had. So, I had to modify my playing a bit to sound more like the original. But I’m used to doing that because I’m a freelance musician. I play in different formations, different styles and different genres of music. But the band that I know the most is Voivod. So, for me, it was pretty natural to not copy the sound but play it with that aesthetic. Play it in the Voivod language. When it came to write music and to play my own solos, my solos are very different from Piggy. My approach and phrasing and scales. Of course, a solo, I think in metal, is our signature from the player. When it comes to riffs and aesthetics I would like to hear from the band as a fan. [I do] what my guts tell me to create. I don’t over-think it. 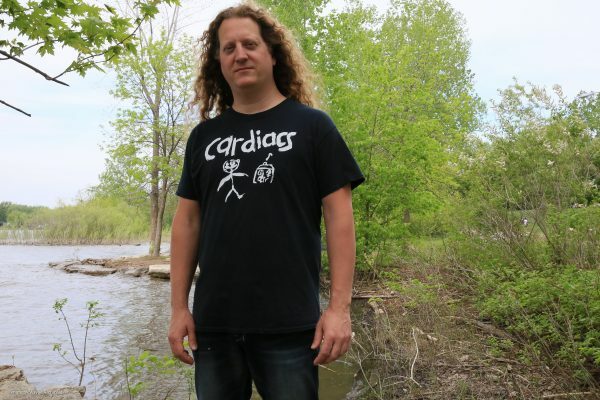 In the beginning, I was over-thinking it and trying too hard, but when I started to forget about it, and was talking to myself saying, I know what Voivod is, I don’t have to try. I just have to do it. And it started to flow and more freely. MM: Your playing on The Wake reminds me of Marty Friedman’s playing on Megadeth’s Rust in Peace. Is he one of your influences, by any chance? DM: Well, it’s a very big compliment that you say that to me because Marty is an amazing musician and an amazing guitar player. Of course, in my life, I’ve listened to many, many guitar players and, of course, Marty Friedman was one of them that I appreciated a lot during the Cacophony era and his own solo album, but I discovered him through Megadeth’s Rust in Peace. I thought he had this Uli Jon Roth kind of bending and phrasing, but he had his own style. So, I’ve listened to his solos and played his solos a lot like I did with Allan Holdsworth. And Bobby Koelble influenced me from the symbolic album of Death because he incorporated a lot of jazz notes in his solos. It’s kind of a fusion of everything I’ve listened to, but I surely have been influenced by Marty Friedman when it comes to bending once in a while. So, it makes sense. MM: Was Target Earth the first album that was all your playing or did they use anything Piggy left on that one? DM: No, nothing from Piggy. It was basically me writing all the guitar parts and Blacky wrote all the bass parts and we wrote the album the four of us together, working as a team. There was nothing left from Piggy at all. MM: So, was that a lot of pressure on you, to not only be new to the band but to have to write all of the guitar parts? DM: Yeah, well, I didn’t see it as pressure. I was playing with the band for five years when we started to write. The past was over and now it was time to say let’s try to write something interesting and if we have something interesting – if it feels right – then we’ll just go on and continue. And it worked pretty good. So, that’s about it. MM: How does the songwriting process usually work? Do you guys start off writing parts individually and bring them to the band to finish or do you all sit in the studio and work on them together – how does the magic happen? DM: Well, most of the time I come up with some riffs, ideas, and structure. Sometimes the bass is recorded already. It’s pretty much starting from the guitar, but sometimes we record drum beats then we put music on it. But, generally, from the guitar. So, from my side, I bring some ideas to the jam space and we jam around with the ideas and sometimes modify them, and Snake will start improvising some vocals. It will take form as we forge, as we sculpt the air with those initial ideas, but they are transformed Voivod songs when everybody has put his input into them. As soon as I bring something and we play it, it’s not mine anymore. It’s everybody’s role to make it better and into a song, basically. MM: So, did you write or co-write every song on The Wake? DM: Yes. I participated a lot in the writing process. I did all the demos at home, recording guitars, and bass parts I would copy from Rocky, or sometimes I would write the bass part and from those demos, we would jam the ideas again and I would record the natural feel of the jams. And then re-do the demos with the tempo of the jams, which were very organic and natural. Then this became the click track for the album. The click track is not static. It moves with the natural feel of the band that I copied into the click track and not the other way around. And we did the same for the EP. The same process that we did for Post Society. So, it becomes more organic. We are not the slaves of the click. The click is a slave to our playing. MM: When you’re writing, do you ever use loops or samples on a computer to kind of figure out where you think the beats should be? DM: No, not at all. And that’s a demand from Away. Because at first – like five years ago for Target Earth – or more than that – I had a tendency to write drum parts. Because I did it with Martyr. I would write the whole drum parts. Away said, “Please leave the drums out of it. I will find the way.” It’s the best thing he ever said to me because he comes up with such a different feel than I was thinking of and that’s what we want. We want to be destabilized. And the ideas and perspective can change in a different direction and become the songs. That’s the beauty of a band, trading ideas, and sharing, and sculpting this piece of art together. It’s a very cool thing to do. So, we never use samples or loops to create a song, but we can add up a little bit of those at the end when we feel like it’s musical. MM: I know you play bass and guitar, but are there any other instruments you play? 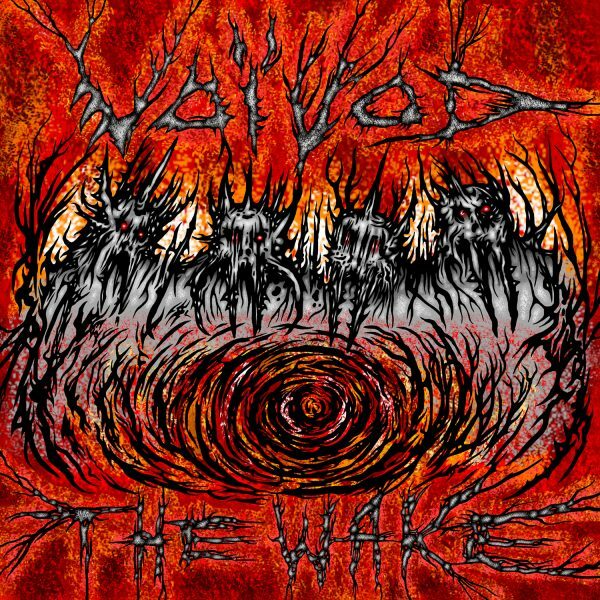 MM: I think The Wake might become my favorite Voivod album because I like it even more each time I listen to it. And I think a lot of that has to do with it being the most melodic Voivod record. Would you agree with that? DM: I think The Wake is very melodic. You’re right about that. Snake has a gift for creating melodies over a chaotic harmony. On The Wake, the melody also is – how can I say it – sitting on a very strong harmony as well. So, if you have a sense of melody, it can be very rich when the chords beneath it are very rich. And I worked a lot on that as well. A lot of songs are not in the same keys. They don’t have the same chord progressions. They don’t have the same dissonance. I’m very conscious about that when I write a whole album. I don’t want the songs to [all] have the same feel, or have the same chords, or the same voicing. So, I think the melody helps the harmony and vice versa. Snake is a very good melodist and he worked a lot in the studio to hit the right notes to fit with the chords that I wrote. It was really, really challenging for him and he did it like a warrior. MM: I know The Wake was recorded and mixed by Francis Perron at RadicArt Studio, but I don’t know who actually produced the record. Did you guys produce it yourselves? DM: We produced it, the five of us together with Francis. He was a big Voivod fan as well. I’ve known him for twenty years or more. So, Francis was part of the team as much as every musician. There was no producer assigned to production because we kind of knew what we wanted. I’ve never personally hired any producer for music that I write. I think I have the perspective to do it myself, but with the five of us working on it, it’s not a war. We don’t need a mediator to avoid arguments because there are no arguments. When there’s something to discuss, we discuss it. But the song is the boss. So, at the end of the day, everything falls into place and we agree on something that is the best for the song. It’s not a big deal for us. We have good chemistry and we know how to talk to each other and respect each other and it’s very, very easy to work with this line-up right now. MM: How have the fans been reacting to the single, “Obsolete Beings”? DM: I saw a load of great positive comments. I saw very, very few bad comments. So, it’s a success for us and we’re really, really happy about it. And it’s cool because metal sometimes tends to become a recipe. We know what a thrash band sounds like. We know what guttural voices sound like. It’s been twenty years that we’ve heard death metal. 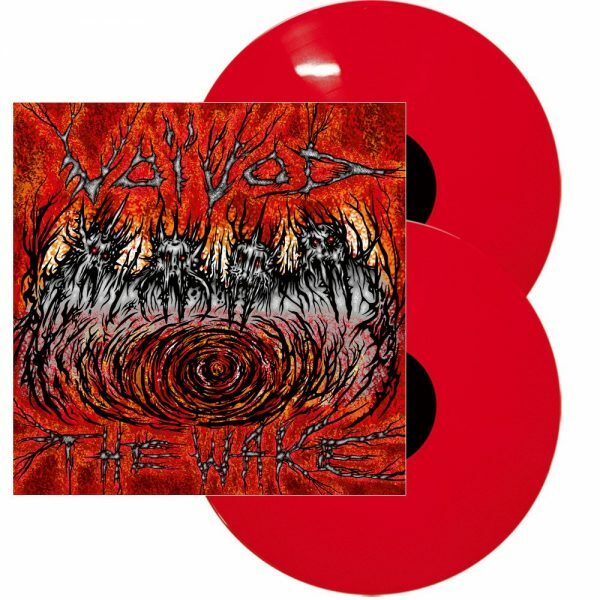 And I’m happy that we came out with something that shows not only the trash part of Voivod, but also the very melodic part of it, and the very proggy part. 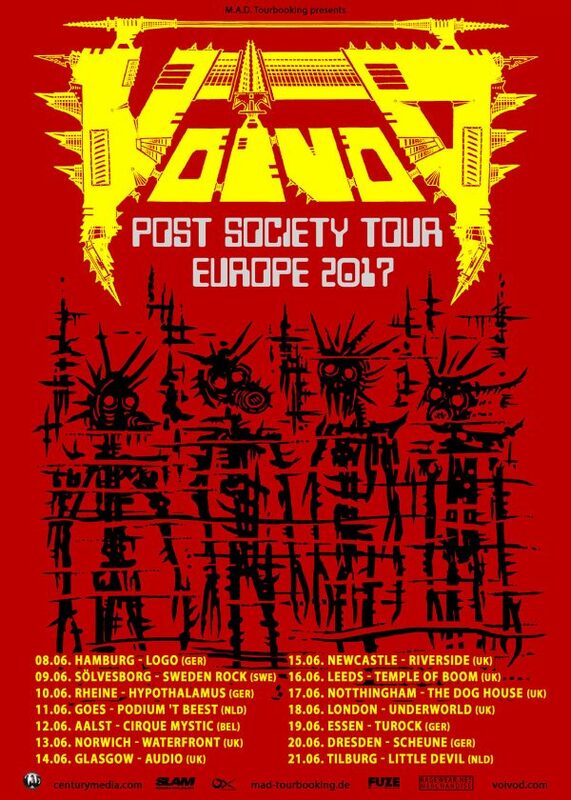 And it’s still pertinent for Voivod to be on the scene and bring something new again. It’s refreshing and it’s the kind of album that me and Rocky, the bass player, as fans, would even be be excited about if Voivod had two other people creating it. When the new Voivod was about to come out I always felt like, “I can’t wait to hear the new stuff and the creativity of the guys all working.” So, we worked with that in mind as well without compromising the music. I’m happy that, I think, we found [something] different than the masses when it comes to new music in 2018. MM: When you guys come up with a set list, is it mostly stuff from the first few albums or is it mostly new songs or a mix? DM: We’re trying to balance it. Because the EP is not that old, and we have had very good reactions. Especially with “Post Society” and “Fall,” which is one of my favorites to play live. Every time we play it, people go nuts. It’s really, really good. But I have my favorite songs as well from Dimension Hatröss and Nothing Face and Killing Technology. We try to balance the setlist so there are some classic songs, some hidden gems, and the newer stuff, of course, which we are totally in right now. So, I think the next tour will be a mix of all that. We’re not gonna play the whole new album. We’re gonna play about half of it for sure. MM: A couple of things that are frequently discussed in Voivod songs are conspiracies and aliens. What are your thoughts on those two topics? DM: Science fiction, alien abductions, and conspiracies are just a reflection of what happens in our own lives in our own society. So, it’s using fiction to point at stuff that doesn’t work. It’s one of the best ways to talk about it because you don’t get involved politically and you don’t get involved with any cultures or countries. You speak your mind through an abstract medium and it has the deep message – the human message – inside of it. It is pure and is not directing it to anybody, which is not the point here. But to express our urge to take care of our own world and our own people. I’m talking about the planet earth, which is the world we live in. I think Snake has a great imagination to put it all together. He told me that the subjects of the songs are directly from the music he hears. So, the music inspires him to pick a subject and [choose] his phrasing then he puts words on the melody. It’s a very interesting way of doing it. MM: I know you just played the Czech Republic and it looks like you’ll be heading back to that area in September. How long will you be touring overseas and will you be touring the U.S. anytime soon? DM: Yes, we’re going from September 7th. We will be in Prague. And we’re going to October 20th. It’s a pretty big tour. I think like thirty-five shows. And we always love to play everywhere in Europe. The fans are very loyal. Very die-hard. And they’ve supported us for so many years, you know? It’s always a very deep relationship and a pleasure and we just want to go back there again. It’s been 35 years that the guys are touring Europe, so the original fans very often have their kids with them and they know the songs as well. It becomes like a family type of thing. And for the U.S. and Canada, we plan to tour both as well, of course. Probably in 2019, there will be some dates. There’s nothing confirmed yet. We plan to tour the whole planet and we will, though. MM: I know a lot of metal bands are still very popular in Japan. Do you have a big fan base over there as well? DM: Yeah. And we’ve never had the chance to play in cities other than Tokyo, but we’re working on it. We would love to play Osaka or Sapporo or Hiroshima or Kobe. I know Japan quite a bit. I’ve been there four or five times. I’ve stayed there for a month. And I speak a little bit of Japanese. It’s a place that I would like to stay for more than one show, for sure. The fans are really, really respectful and they’re die-hard fans over there. My second show with Voivod was in Japan. [Laughs] So, to me, it’s very special. MM: I understand you’ve played with artists in just about every genre under the sun, including pop and reggae. Did you perform with all of these artists as a touring member of their bands or was it mostly studio work? DM: It was more of a live situation most of the time. TV shows as well. That would take me to a company with folk singers, pop singers, country, then reggae. So, you have to be a chameleon. You have to have the good guitars, the good tools, the good tone. That’s very challenging, but it’s been my job for 25 years to do that. And I’m very curious about other styles of music. I think music is multidimensional and to play only one style would be very boring, though there is nothing compared to the power and the intensity of a metal band. Or a metal crowd. Or a metal show. I’ve never experienced anything like that with any other style, so I always come back to it. And there’s a place for creativity in that aesthetic. I’m still very happy to play and create in that style for sure. I come from that music as well, so that’s where I started, you know? DM: [Laughs] Sometimes it happens. When I have free time I go on the internet and watch some random series. 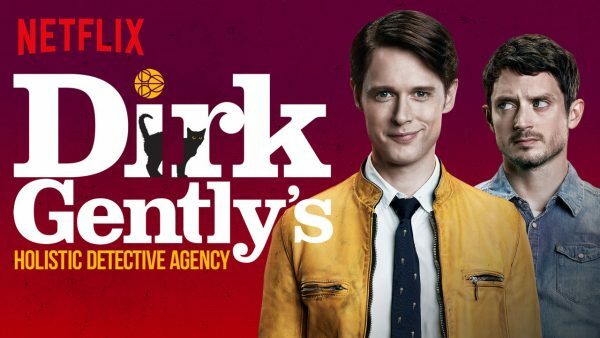 But because I’m a big Douglas Adams fan, I just saw the Dirk Gently’s Holistic Detective Agency. Since that came out on Netflix, I’ve started to watch that. I don’t have any opinion on that. It’s too soon. But we have to change our minds from time to time. I really like documentaries about different subjects. History or architecture or archeology. I watch very diverse stuff, depending on how I feel. DM: I was lucky enough, but I think it was being a paperboy. Probably, yeah. I was pretty young. I was like ten years old. It was like 200 newspapers for ten dollars. It was super badly paid then I didn’t last long in that job. Then I started to give guitar lessons and work in a music store and it was music from that point on. DM: Bicycle. I’ve done a lot of bicycling for eight years. I try to do three or four thousand every summer. Now I’m around 2000 so I have to do more. That’s a very good way of evoking endorphin and it’s good for your mind and your heart and your health. So, that’s what I do. MM: Vinyl has been making a big comeback during the past decade and I know The Wake is being pressed on vinyl. Are you a vinyl junkie yourself? DM: I’m not a vinyl junkie, but I buy more and more. I didn’t have a table before, but I found one. And I think it’s cool that it’s coming back because it’s a ritual to open it and to see the big picture. It’s kind of like making your own coffee, or your own espresso, or anything. It feels like someone actually worked to make that. It’s not like an mp3 or streaming or something like that. You have the actual object in your hands and it has a value. So, I’ve bought the first Stratovarius album. I’ve bought some Michael Jackson albums. Some different jazz, classical and metal. I bought Forbidden’s second album and I just ordered Jason Becker’s Perpetual Burn album. From time to time, I buy one here and there. MM: When was the last time you bought a CD? DM: Probably on tour. Sometimes the opening bands are really, really good and I just go over there and buy a shirt and a CD. It helps them and it becomes part of my library so to speak. MM: Final question. If someone was giving you a million dollars to give to charity and it all had to go to one charity or cause, which would you give it to? DM: Something to do with abandoned kids. Or sick kids. For sure. My dream tour is Iron Maiden with Voivod opening. They’re different, but they’re both metal with prog leanings so I think it would be an awesome thing. If you ask me, there should be a big 5, not a big 4. Those should be Metallica, Anthrax, Megadeth, Slayer and Voivod. There you go!